A New Zealand kebab shop owner continued to serve a customer while ignoring an armed would-be robber who came into his restaurant, according to CCTV footage. Said Ahmed of Christchurch, New Zealand, was working alone late at night and preparing a chicken souvlaki for a customer when an armed man walked in and tried to rob the Taste of Egypt takeaway shop. 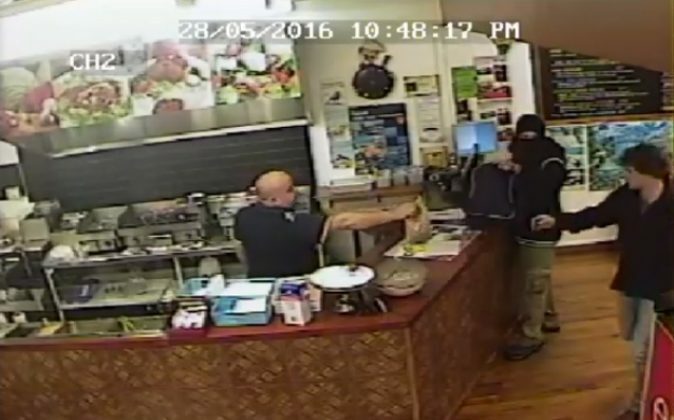 CCTV footage of the May 28 incident released by Canterbury Police shows Ahmed smiling at the robber who is dressed in black and wearing a face mask. The armed man approaches the counter and shakes a sports bag in Ahmed’s face with one hand and points a pistol at him with the other. Ahmed, originally from Egypt, smiles—completely unfazed—and turns to finish bagging a meal before handing it to his customer—who takes the food and scuttles away pretty quickly. The suspect is awkwardly standing, still waiting with pistol in hand. Ahmed then turns back towards the kitchen. The armed man gives up and quickly leaves the shop. The 26-second video has been viewed more than 190,000 times as of July 12, with commentators praising Ahmed for his fearlessness. “This has got to be the most chill chip chip operator ever!” wrote a Facebook user. “He didn’t scare me… he was surprised from my reaction,” Ahmed told Fairfax New Zealand. Ahmed, who migrated to New Zealand from Egypt 20 years ago and has a degree in agricultural engineering, said it was the first incident he has ever experienced in the 15 years he has owned the kebab shop. “When he had gone my heart was beating hard,” he told the New Zealand Herald, saying he “thanks God” because things could have been worse. Canterbury police are investigating the incident.